I’ve had the pleasure of getting to know Mallory a little bit over the last few years when she was a bridesmaid in several weddings I photographed for two of her closest friends. When I got the inquiry to photograph her and her hubby’s newest family addition, a sweet baby boy, I was over-the-moon excited! 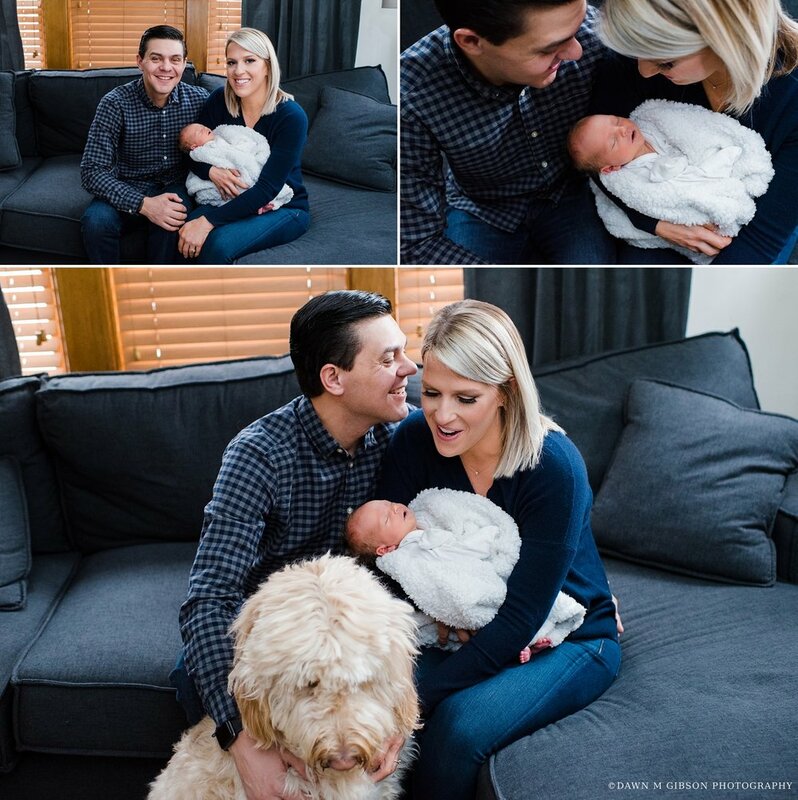 I put newborn sessions on hold the last few years because I really wanted to focus more on the documentary photography side of my business – services I am able to provide with my birth stories and real life family sessions. Photographing the candid, natural moments that occur between loved ones without any direction from behind the camera is my deepest passion. However, when I had my own son back in May, I realized how important it is to have photographs that are also lightly posed in nature, too. The years (especially with little ones) go by so quickly, and it’s so easy to get wrapped up in the day-to-day and forget to carve out time for preserving life as it was like in the present moment. 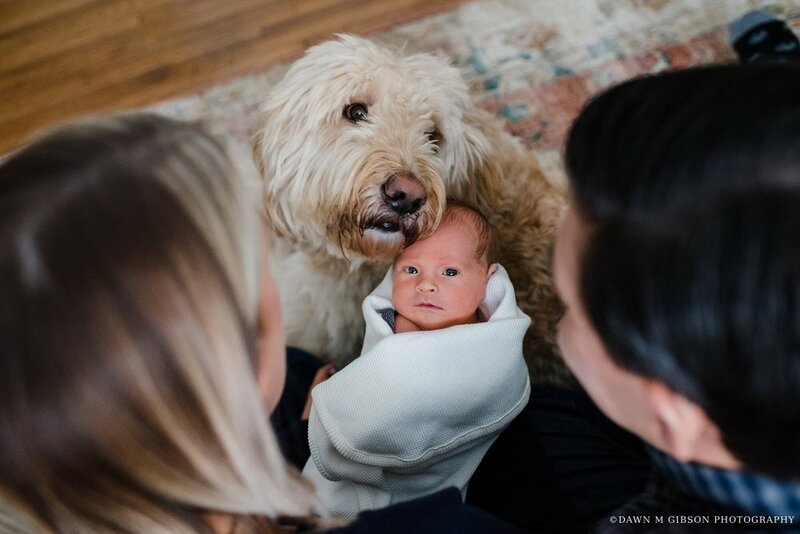 For the Finnegan family, their in-home newborn session was focused on preserving these early moments spent together at home with their fresh baby in their arms and their fur baby loving on their sweet newborn. I documented the tiny toes and baby yawns, all the hard work that went into creating the most perfect nursery, and they posed for some first family portraits together. Next year, their lives and the atmosphere of their home are going to look so different, and it brings me so much joy to be able to provide these images that preserve the moments of today. My heart fills with joy anytime I am invited to be a part in capturing a special story for a couple or family. I am excited to again be offering in-home newborn sessions like this one, along with continued photography services around families, including Maternity Sessions, Birth Stories, First Hours (Fresh 48) Sessions, Real Life Family Sessions, and Traditional Family Portraits. I am currently booking spring and summer sessions, so if preserving family memories is a priority for you this year, I’d LOVE to hear from you and discuss your upcoming photography needs!